Ms. Bussey received her Bachelor of Business Administration in Business Honors and Management Information Systems with a minor in International Business and a concentration in Spanish from the Red McCombs School of Business at the University of Texas at Austin, where she graduated with Highest Honors. Ms. Bussey has enjoyed a non-clinical role in the field of anticoagulation therapy for more than a decade. 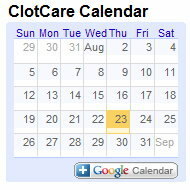 In addition to working as both a consultant and a developer on several patient management systems designed for use in a clinic setting, she has worked with ClotCare co-founder, Dr. Henry Bussey, to develop ClotFree, an online management system to facilitate anticoagulation patient self-testing. She also serves as the Exam Support Liaison for the National Certification Board for Anticoagulation Providers, which maintains and administers the Certified Anticoagulation Care Provider (CACP) Credential. Her most long-standing involvement in this field has been her work on ClotCare, which she co-founded in 2000. She currently runs her own information technology business, Genesis Advanced Technologies, Inc.